Open-source GMOs to fight climate change and take down Monsanto. It will help fight climate change and stick one in Monsanto’s eye. 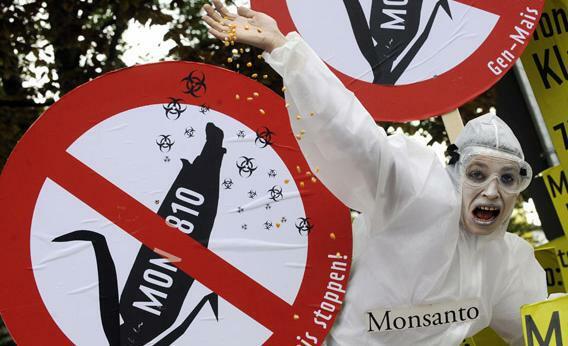 A German citizen protesting Monsanto. Can the biotech giant ever be slowed? Not too long ago, popular wisdom ran that molecular biologists were going to save billions of people from starvation by genetically engineering crops resistant to flood, freeze, and drought; crops that could blossom from desiccated soil and bloom in salty sand; crops that could flourish despite an atmosphere saturated with carbon dioxide and rays of sunshine riddled with radiation. A waterless seed was the next killer app. “With the help of our Gods and our science, we must not only increase our food supplies but also insure them against biological and physical catastrophes,” declared agronomist Norman Borlaug in his 1970 Nobel Peace Prize acceptance speech. But despite the hopes of Borlaug and the hype of Enright, genetically modified crops as we know them have as a general rule increased agriculture’s reliance on a system of expensive “inputs”—agro-speak for the proprietary seeds and herbicides that have brought untold profits to multinationals such as Monsanto and Dow. The reputation of transgenic crops has tanked, as what was once a harbinger of green technology is now commonly perceived as a source of genetic pollution and has thus become anathema for many environmentalists. The GMO story has become mired in the eco-wrecking narrative of industrial agriculture, and that is too bad for those who understand the real risks of climate change and discern our desperate need for innovation. And while the blue-sky hype of a genetically secured food supply has not become a reality, there have been a few breakthroughs. Even as climate change has increased the prevalence of many plant diseases, the new science can take credit for genetic inoculations that saved Hawaii’s papaya business. It’s also led to flood-resistant rice, created by Pamela Ronald of the University of California–Davis. Of course, the party-line foodie dare not say anything positive about GMOs, at risk of being labeled a stooge of the foodopolists. And it’s true: Monsanto, Dow, Bayer, and Pioneer are not interested in GMO innovations that might help the bottom billion—molecular ramp-ups of crops like cassava, millet, or teff. They are not interested in low-insecticide eggplants that would help clean urban water supplies in South Asia. There’s not enough money in it for them. So the question looms: How can we harness the possible positives of GMOs without lining the pockets of the pharmers? Open-source GMO is a new idea for food justice activists, who have been concentrating their efforts on depleting Monsanto’s market share through consumer advocacy and political reform. Labeling laws for genetically modified organisms in the retail foodstream are about to land in statehouses across the country. But genetic modification does not equal Monsanto and Pioneer. The time has come to separate the dancer from the dance and admit that it is possible to be against big-agriculture and for scientific advancement. Turns out that permissiveness requires police and plenty of lawyers. Which is why the so-called “patent left” and “copyleft” movements have created clever licensing agreements that infect any and all derivative products, thereby enforcing the free availability of innovations going forward. Open-source agriculture joined the patent left movement when Cambia Technologies, an Australian biotech company that researches and develops GMOs, offered a licensing agreement called BIOS, which allows for the free use of a technology called “transbacter.” Transbacter can be deployed to alter plant genetics, and its aim is not one specific modification for one specific corporate interest but to enable a slew of innovations. But BIOS, like all the other open-source initiatives, is far from perfect, as it creates the paradox of endlessly replicating armies of anti-licensing licenses. The way out of the logical mire—and the way to marshal agri-tech to the cause of climate change—is an explicit exception in the licensing law, an intellectual property loophole for food. Everyone interested in global food knows that agriculture has had a largely negative impact on global warming, but few have recognized that legal reform of food-related intellectual property laws can help ensure a path to a more ecologically secure future. No doubt, biological “input” is far more complex than computer “input,” but the idea of a swarm of bio-hackers bringing down Monsanto and Dow is too delightful to dismiss. Throw climate change into the picture, and the stakes are simply too high for continuing the status quo of patented food. Neither information nor lunch may want to be free, but eventually we will need to get around to the business of sequencing proteins that have less to do with quarterly profits and more to do with centuries of ecological abuse. And those will be the only inputs that matter when the big heat hits. Also in Future Tense’s July series on agriculture and climate change: Michael Pollan explains the difference between “sun food” and “oil food,” and David Biello examines why so many farmers don’t believe in climate change.